Cookies and I don’t get along very well. Don’t misunderstand me. Of course I like to bake and eat them. But I have a really, really hard time coming up with decent cookie recipes. When I first started baking, I used baking mixes and switched to recipes from cookbooks pretty soon. Then I went vegan and started this blog at the same time. At first I came up with all of “my” baking recipes by veganizing “regular” ones. But I really have a problem with being perfect. So I always thought that modifying a recipe that is already there wasn’t enough. I wanted the recipes posted on by blog to really be my own recipes. Made from scratch and not based on other recipes. Making pasta sauce from scratch is easy. But coming up with your own cake recipe may end up in a huge kitchen disaster. At least if you are me. It’s not a coincidence that in order to call yourself a baker in Germany you have to go to school for three years. So of course I really didn’t know where to start when I wanted to make my own cake from scratch. I read books on baking and tried to figure out how to apply all the stuff I had read to vegan baking. It was a lot of work but several kitchen disasters later I can proudly say that my cake recipes truely are my recipes. Not so when it comes to cookies though. I never really figured out how to make them from scratch. Okay I have to say that right when I was about to find it out life happened and instead of studying ingredient ratios I had other things to do. So today you will again find a “new” recipe based on another recipe. Well, probably my own cookie recipes are as important as the proverbial sack of rice in China. There are already so many great recipes out there, why would anyone want to add a new recipe to this collection? (Sometimes I am glad that recipes aren’t like plastic bags. They aren’t tossed out and end up in the ocean to poison the sea animals. ) There are more and more of them every day and most of them will never be tried out and forgotten very soon. Sometimes when I lack the motivation to blog I tell myself that yes, all of this may be the case but that it doesn’t matter. I have a tiny blog and many people I know probably think it’s crazy to write about recipes. It’s just not an important topic. And they may be right. But for me as an ethical vegan it is an important topic. I write this blog to show people that life without meat, milk, and even cheese is possible. And I write this blog for myself. (I am probably even writing this post for myself.) I really enjoy cooking and baking. For me it is a perfect way to relieve stress, to distract my mind or to cheer myself up. I really enjoy doing this. Plus, writing recipes is a special kind of challenge for me: when something turns out well, I can enjoy some good food and put the recipe on my blog to share it with others. If not, nobody (except for P and me who will have to eat the mess if it is edible) will ever know. So you cannot fail. Which is a really great feeling and makes writing a food blog a very postive and creative thing. And this is why I want to develop my own recipes. Wow, if you are still reading you really, really deserve some cookies now. The cookies itself are very simple and plain. 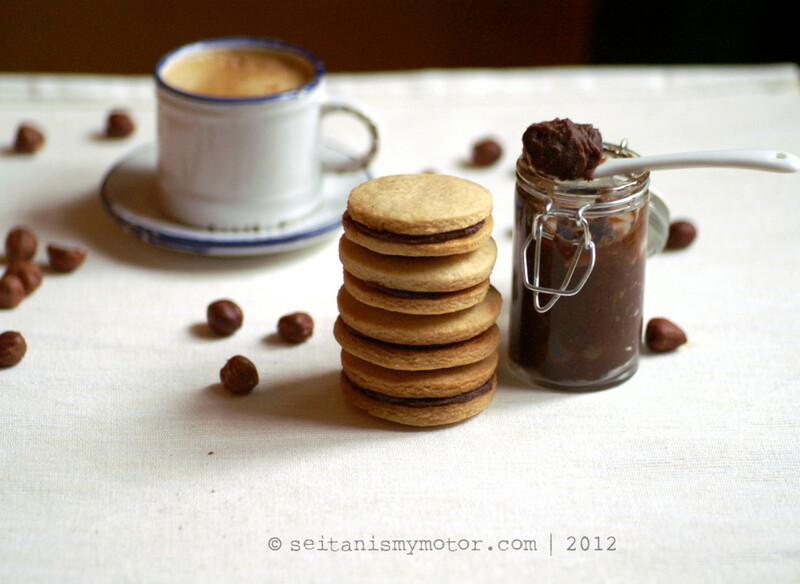 The filling is adapted from my chocolate hazelnut spread recipe. Made with 1/4 cup of Kahlúa and a pinch of tonka bean it becomes “grown up” version of the spread and gives the cookies a special twist. Tip: The cookie dough has to be made one day in advance. To safe time, you can also make the filling ahead and store it in the fridge. Cookies adapted from this recipe. Cream together margarine and sugar. (For this rather small amount I used my mini food processor. A handheld mixer works probably well, too.) Add hazelnut butter and liqueur and process until everything is combined well. Mix flour, baking powder and salt. Add 1/3 cup of flour to the food processor and pulse until most of it is incorporated. Repeat with the remaining flour. (Don’t add more than 1/3 cup at a time.) Process into a crumbly mass and transfer to your working surface or a bowl. Gather the dough together and form a disk. (The hazelnut butter I used is rather runny. If yours is smooth and the dough doesn’t come together, add some non-dairy milk by the teaspoon until it does.) Wrap in plastic and refridgerate over night. Preheat the oven to 180°C (350°F). Line two baking sheets with parchment paper. Roll out the dough about 1/2 cm (1/4 inch) thick. Use a 5 cm (2.5 inch) cookie cutter to cut out 26 disks. Transfer to baking sheets and bake one sheet at a time for 7-8 minutes or until the cookies aregolden brown. Let cool for two minutes before ransferring to a rack. Combine Kahlúa, hazelnut butter, sugar, and tonka bean in a small bowl. Stir well. Pour in chocolate and stir until everything is well combined. The hazelnut butter I use is rather runny. If your nut butter is more of the solid kind, add the optional oil. Refridgerate for one hour, or until set. To assemble the cookies spread a grape or small walnut sized amount of chocolate spread onto one cookie and top with another one. I love the combination of chocolate and hazelnut! These cookies look delicious and elegant enough to serve at some sophisticated party. Thanks for including a “pin it” button so I can easily save and bake these some day.